I took a SSS piestra die and made a mask with some Eclipse paper and sponged Fresh merlot, red currant, mango, tuscan olive and sicilian blue. I added the sentiment with some black ink (Mini Blooms) and that's it! A very simple one layer card. Oh - and if you need any new supplies, check out my sale page here for some crafty items I have on sale now ... if you need some new supplies, see if any of my items interest you. LOVE how you created a rainbow of colors on this card. Simple, yet beautiful! Love the variety of colors ~ think I might need to look for Eclipse paper. Great results again, Cara! 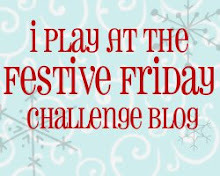 I got some Festive Friday shout outs!